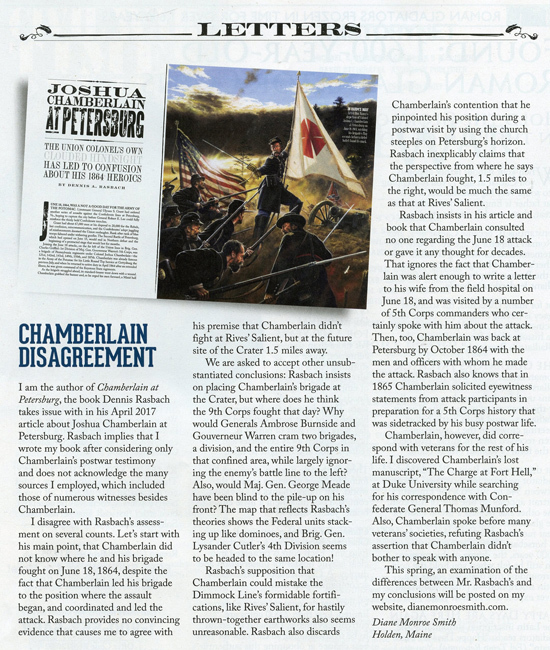 After the Civil War Times published an article by Dennis Rasbach in their April 2017 edition,“Joshua Chamberlain at Petersburg,” the Times gave me an opportunity to respond with a letter to the editor which they published in their June 2017 magazine. Rasbach’s article is a reiteration of the theories he offered up in his recent book, which attempt to refute Chamberlain’s testimony regarding his and his brigades’ assault at the Battle of Petersburg, June 18, 1864. Rasbach insists that Chamberlain did not know where he and his brigade fought, despite his having led them to the position where the assault began, and having coordinated and led the attack. Discarding all testimony that the 1st Brigade assaulted Rives’ Salient, Rasbach asserts that the future site of the Crater, 1.5 miles to the Federal right, is where Chamberlain attacked. Evidence that the 9th Corps, Crawford’s Division and Sweitzer’s Brigade fought where Rasbach is determined to also place JLC, apparently did nothing to dampen Rasbach’s enthusiasm for what to me is a nonsensical and poorly defended theory. 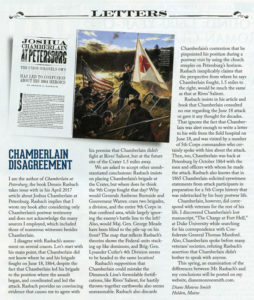 I am the author of Chamberlain at Petersburg, the book Dennis Rasbach takes issue with in his April 2017 article about Joshua Chamberlain at Petersburg. Rasbach implies that I wrote my book after considering only Chamberlain’s postwar testimony and does not acknowledge the many sources I employed, which included those of numerous witnesses besides Chamberlain. I disagree with Rasbach’s assessment on several counts. Let’s start with his main point, that Chamberlain did not know where he and his brigade fought on June 18, 1864, despite the fact that Chamberlain led his brigade to the position where the assault began, and coordinated and led the attack. Rasbach provides no convincing evidence that causes me to agree with his premise that Chamberlain didn’t fight at Rives’ Salient, but 1.5 miles away. We are asked to accept other unsubstantiated conclusions: Rasbach insists on placing Chamberlain’s brigade at the Crater, but where does he think the 9th Corps fought that day? Why would Generals Ambrose Burnside and Gouverneur Warren cram two brigades, a division, and the entire 9th Corps in that confined area, while largely ignoring the enemy’s battle line to the left? Also, would Maj. Gen. George Meade have been blind to the pile-up on his front? The map that reflects Rasbach’s theories shows the Federal units stacking up like dominoes, and Brig. Gen. Lysander Cutler’s 4th Division seems to be headed to the same location! Rasbach’s supposition that Chamberlain could mistake the Dimmock Line’s formidable fortification, like Rives’ Salient, for Hastily thrown-together earthworks also seems unreasonable. Rasbach also discards Chamberlain’s contention that he pinpointed his position during a postwar visit by using the church steeples on Petersburg’s horizon. Rasbach inexplicably claims that the perspective from where he says Chamberlain fought, 1.5 miles to the right, would be much the same as that at Rives’ Salient. Rasbach insists in his article and book that Chamberlain Consulted no one regarding the June 18 attack or gave it any thought for decades. That ignores the fact that Chamberlain was alert enough to write a letter to his wife from the field hospital on June 18, and was visited by a number of 5th Corps commanders who certainly spoke with him about the attack. Rasbach also knows that in 1865 Chamberlain solicited eyewitness statements from attack participants in preparation for a 5th Corps history that was sidetracked by his busy postwar life. Chamberlain, however, did correspond with veterans for the rest of his life. I discovered Chamberlain’s lost manuscript, “The Charge at Fort Hell,” at Duke University while searching for his correspondence with Confederate General Thomas Munford. Also, Chamberlain spoke before many veterans’ societies, refuting Rasbach’s assertion that Chamberlain didn’t bother to speak with anyone.